You set the hostname for the Smoothwall during installation. However, you can use the administration interface to change the hostname at any point. Tip: Typically, the hostname includes the name of the domain that the appliance is in. 1. Go to System > Preferences > Hostname. 2. Enter a new value in the Hostname field. 4. Reboot the Smoothwall either by clicking the rebooted link in the Warning panel that appears at the top of the page, or by browsing to System > Maintenance > Shutdown. 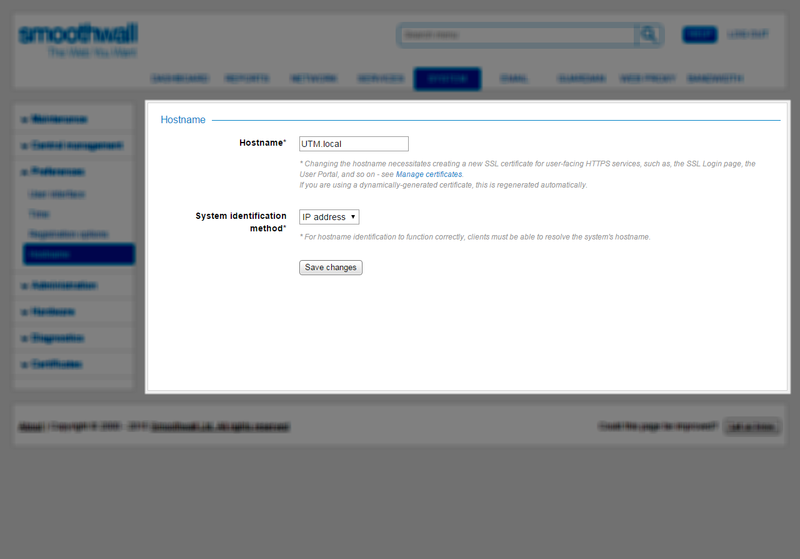 Note: Changing the hostname causes the Smoothwall to regenerate its SSL certificate. You must re-import it to any hosts that have imported the original certificate, for example, those that use SSL log ins. By default, the Smoothwall identifies itself to the network using its IP address. You can change this so it uses hostname identification instead, but you must ensure the hostname can be resolved. Note: For centrally managed Smoothwalls behind a load balancer, hostname redirection is to a common, shared hostname for the cluster, not to the hostname of the parent node. When Hostname is selected for the System identification method, the user interface advises the hostname used. To change the hostname used, go to System > Central management > Settings — see Setting up a Centrally Managed System.